School District #741 voters will decide on a proposed $415 per pupil levy on Tuesday, April 23. Polls in the lobby at Paynesville Area Elementary School will be open from 12 noon to 8 p.m. Voters in School District #741 are being asked to head to the polls on Tuesday, April 23, to decide on a $415 per pupil levy proposal for the school district. Polls will be open in the lobby at Paynesville Area Elementary School (205 West Mill Street) from 12 noon to 8 p.m. The ten-year levy would go on the property tax rolls in 2003, and the revenue would be received by the school district to use in the 2003-04 school year. The $415 levy proposal would generate $560,546 for the district in that school year. The district, according to its promotional material, plans to use this money to maintain small class sizes, continue strong academic programs, keep quality teachers, provide additional college credit offerings, rebuild the fine arts and athletic programs, provide appropriate staff development for staff, and offer enrichment curriculum for high-potential students. Without the levy, the school district will have no choice but to right its financial situation through more budget cuts. The district made $500,000 in budget cuts that took effect this year, and approved $400,000 in budget cuts this winter that will take effect in 2002-03. Since the district is in Statutory Operating Debt (SOD), it has submitted a required plan to the state. Currently, that SOD plan calls for future budget cuts averaging $200,000 per year from the 2003-04 to the 2006-07 school years. In the SOD plan, superintendent Howard Caldwell estimated that the district would need to make another $100,000 in cuts in 2003-04, $200,000 in cuts in 2004-05, $250,000 in 2005-06, and $250,000 in cuts in 2006-07. Passing the levy should reduce the need for some of these cuts, as well as provide funds to reinstate some of the recently-cut items. In addition, the school district was able to reinstate $65,000 in educational programming for 2002-03, after originally cutting it, thanks to the donations gathered through the "Keep the Quality" campaign. Money from that campaign, though, will only provide for these programs for one year. 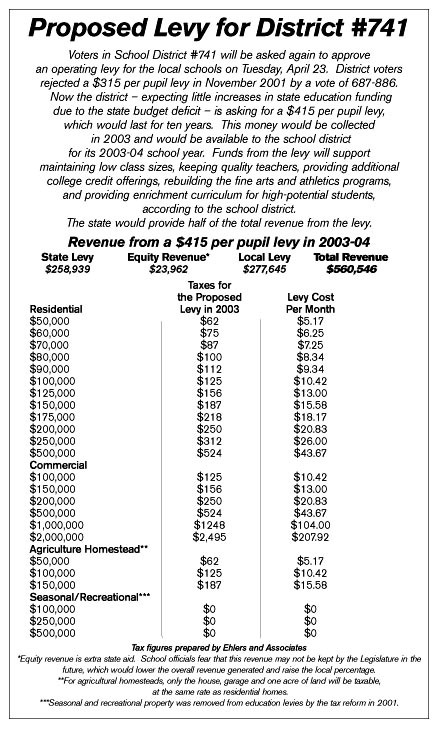 Without a levy, another $65,000 in cuts likely will have to be added to the budget cuts for 2003-04. Local school district officials maintain that minimal increases in school funding by the state in past years have not kept pace with rising inflationary costs, making the levy necessary. District #741 effectively will get a $100 per pupil increase next year, around a two percent increase. District voters rejected a $315 per pupil levy proposal last November, by a vote of 687-886. The school board is actually asking for a higher levy this time. In large part, the decision to ask for more per pupil hinges on the state's budget woes. After years of running a surplus, the state government is now dealing projected deficits, leading school board members and administrators to wonder if school funding will get any increases at all in the coming years. Already, during the current session, the idea of cutting some funding to schools has been raised, so local officials believe that a locally-approved levy is the only way to insure a funding increase for District #741. The levy means additional property taxes, even though nearly half of the money will come from the state. Of the $560,546 the district would receive in 2003-04, $277,645 (or 49.5 percent) would come from local property taxes and $282,901 (or 50.5 percent) would come from the state. Commercial and residential property, as well as agricultural homesteads (house, garage, and one acre), will be taxed for this school levy if passed. Seasonal/recreational property and agriculture land is exempt from the school levy, thanks to last year's tax reform. That means seasonal lakeshore owners will not contribute to this school levy, and farmers will only have to pay taxes on their house, like city dwellers, and not on all their acreage. The school board and administrators will be available to answer questions about the proposed levy one more time before the vote, on Monday, April 22, from 5:30 to 7:30 p.m. at Paynesville Lutheran Church. Applications for absentee ballots are available at the district office until Monday, April 22, at 5 p.m.